The Vestini were a group of Italics who, during the Iron Age, were located in the eastern centre of the country, the modern Abruzzo region. They were neighboured by the Umbri and Picentes to the north and north-east, the Paeligni, Marrucini, and Frentani to the south, and the Marsi and Sabini to the west. The Oscan-Umbrian group of which the Vestini were part are largely accepted as being Indo-Europeans (perhaps proto-Celts) who migrated into the peninsula from the north. They settled in mountainous communities between the Gran Sasso d'Italia mountain (the highest peak in the Apennines) and the northern bank of the River Aternus (the modern Aterno), with primary settlements at Aternum (Pescara, shared with the Marrucini), Aufinum (modern Ofena), Peltuinum (modern Prata d'Ansidonia), Pinna (modern Penne), and Pitinum (near modern L'Aquila). Strabo and Pliny, along with other ancient writers, claim the Sabini as a division of the Opici. They also state that the Picentes and Samnites were originally tribes of the Sabellians. This was a collective of central Italian tribes during the Iron Age, comprising the Marrucini, Marsi, Sabini, and Vestini. 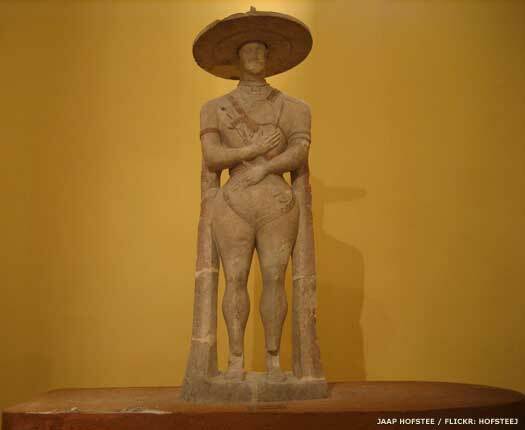 More specifically, the Picentes and Samnites may have been a division of the Sabini. Writers frequently link one to the other, sometimes referring to the Samnites as Sabellus, seemingly as an umbrella term for their origin. It seems that all of these tribes may have descended from the Opici. The nearby Frentani seem to have joined the Samnites as the confederation expanded its territory towards the Adriatic coast. Their location apparently allowed them to act independently, and for the most part they were seen as a fully independent people. They generally had much more in common with the minor peoples to their north, the Marrucini, Paeligni, and Vestini. The language of the Vestini came from the Oscan-Umbrian group of Indo-European languages (P-Italic), which were widely spoken in Iron Age central and southern Italy before the rise to dominance of Latin (Latin itself was a slightly more distantly related language, coming from the Indo-European Latino-Faliscan group, or Q-Italic). One of the best examples of their language is the 'Warrior of Capestrano' with the script written vertically on one line, to read from the bottom to the top, in a Sabellic language that is related to a stele from Penne (the Vestini town of Pinna) and clearly related to Osco-Umbrian. The region of central eastern Italy is settled by an Italic people who become known as the Picentes. Strabo claims that they are part of a group known as the Sabellians (along with the Marrucini, Marsi, Sabini, Samnites, and Vestini). They possibly eject mixed settlements of Siculi and Liburni to take the land, pushing the former inhabitants southwards. Probably by this period the Frentani have occupied the territory in the modern region of Molise, on the Adriatic coast, immediately north of the Gargano promontory. Their territory puts them up against the Marrucini and Vestini. The 'Warrior of Capestrano' is a larger than life Vestini sculpture that dates from this century (or possibly to the fifth or fourth century, opinion is divided). It is discovered by archaeologists in 1934 in Capestrano, which in the Iron Age is within Vestini territory. The product of sculptor Aninus, it represents the so-called 'King of the Vestini', Naevius Pompuledius, and also tantalisingly calls him one of the last kings of the people of Abruzzi, leaving the rest, both before and after, unnamed and forgotten. 'King of the Vestini'. One of the last kings of Abruzzi. By this stage, the Samnites are undoubted masters of the central southern Apennines, probably having evicted or absorbed any remaining Opici and pushing their remnants towards the Tyrrhenian coast of Italy. The Opici appear to quickly disintegrate as a recognisable group, with this process seemingly speeded up by their fragmentation into various smaller groups which include the Aequi, Brutii, Hernici, Lucani, Marrucini, Marsi, Picentes, Sabini, Samnites, Vestini, and Volsci. This process occurs between the tenth and sixth centuries. 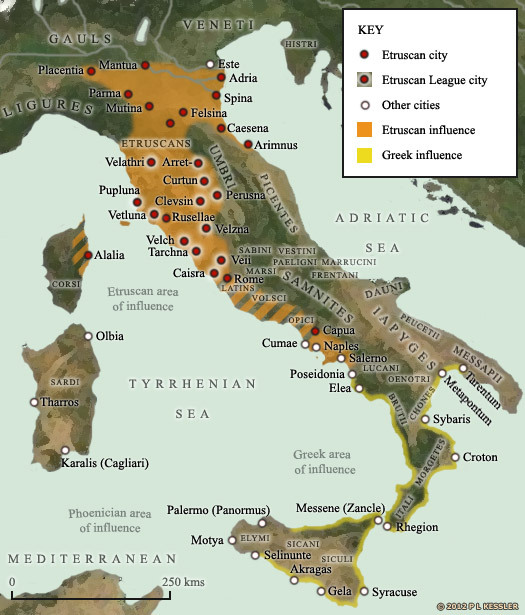 The Second Samnite War is triggered against Rome, and the Samnite commander, Gaius Pontius, leads a force of around 9,000, including a thousand cavalry, with which he wins several early victories. When the Samnites are finally defeated in 304 BC, their confederates, the Frentani, Marsi, Marrucini, and Paeligni, voluntarily accept their reintegration into Roman administrative rule. All the other Samnite allies are also subjugated by Rome. In fact, the Frentani seem to be politically connected far more closely to the Marrucini, Paeligni, and Vestini than with the Samnites by now. The Vestini themselves agree an alliance with Rome in 302 BC in which they retain their independence and issue their own coins. Despite the Vestini retaining their independence from Rome through a joint agreement, a Latin colony is still founded within Vestini territory. Livy mentions the founding of Hadria (modern Atria) around this time, but despite this infringement, the Vestini language survives into the middle of the second century BC at least, before it is submerged by Latin dominance. When the Vestini do start to speak Latin, it is the form used by the Aequi and Marsi rather than by Rome. The Second Punic War is fought against Carthage. Rome is aided by its Etruscan, Picene, and Umbrian forces, but Italy is invaded by Hannibal Barca and a Roman army is massacred at the Battle of Cannae, killing 60,000. Along with the Etruscans, Lucani, Marrucini, Marsi, Paeligni, Picentes, and Vestini, the Samnites fight the Social War (Italian War, or Marsic War) against Rome. For once, the Frentani also join in opposition to Rome, but they appear to agree terms early on, along with the Latins and Umbri, and play little part in a war that is the result of increasing inequality in Roman land ownership. The spark for conflict is delivered by the assassination of the reforming Marcus Livius Drusus, whose efforts would have led to citizenship for all of Rome's allies. Probably the Vestini leader during the Social War. Although defeated, the Italic tribes are granted the Roman citizenship which had previously been withheld from them. The fate of Gaius Pontidius is unknown, although most of his colleagues are killed in action between these dates.